You brought the real happiness into my life. You make me feel complete. I wish I could love you as much as you love me. Happy Anniversary! I wish on our anniversary that our love will never be seized, it will wider than the Sky, grow higher than the Everest, brighter than the Stars, stronger than the Diamond and warmer than the Sun. I’m the luckiest guy to have you beside me. It’s cool to get the chance to spend my every day and night with you. Happy anniversary sweety, I love you! I’m so much happy to have you in my life. In every way, you complete me, dear. Thank you for everything! 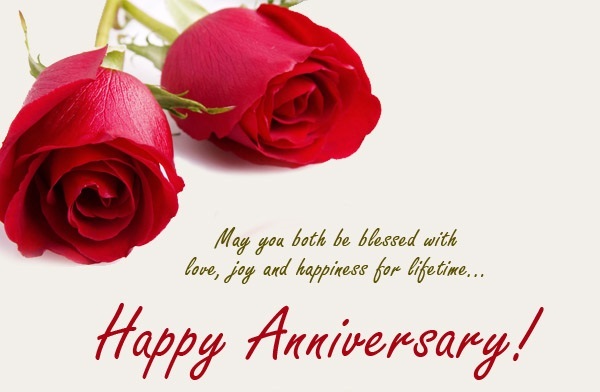 Happy Anniversary wishes to my lovely wife. Through my life’s ups and downs, you’re always there. In you, I have found my spouse, lover, partner, and best friend forever. 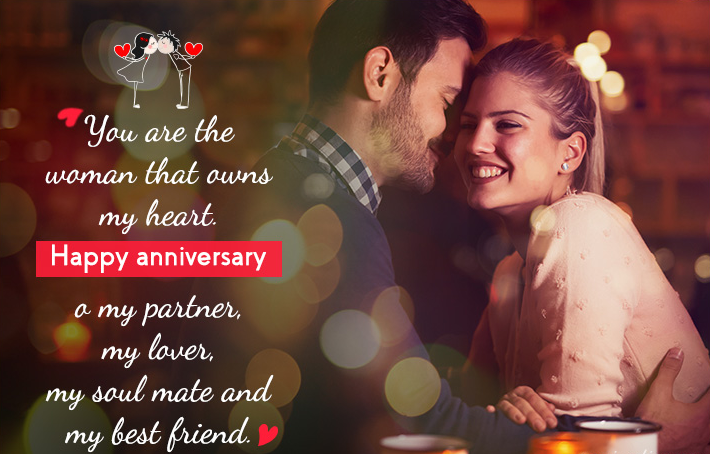 Happy Anniversary, sweety! 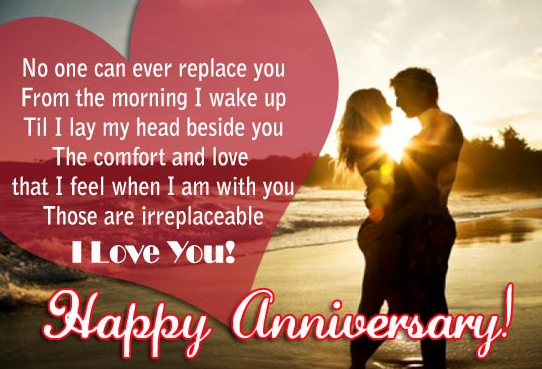 If you ask me that “I still love you as before”, my answer will be “You are my everlasting better half and I’ll love you till the last day of my life.” Happy Marriage Anniversary. Life may have given me many reasons to be happy. But I’m happiest because life gave me a precious gift like you. You are my dreams come true. Many many happy returns of the day. It’s a special day to me because from that day I came to know what is called thinking for someone, love for someone and caring for someone. Happy Wedding Anniversary. My heart only wants to love you, my heart wants to come only to you, my heart wants the cutest smile on your face and it always wants to stay just with you. 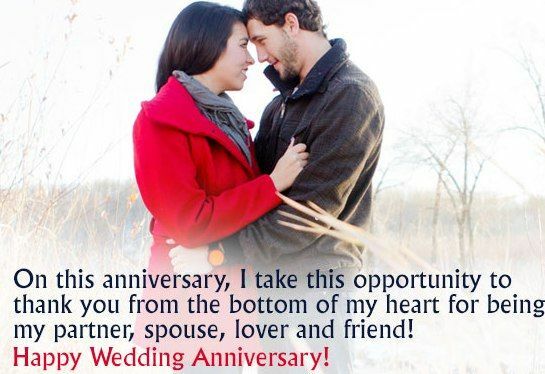 Happy Anniversary my love! You make me so happy the way no one can. My love for you will never ever slow down. I will love you the decade to century and life after life. Lots of love to you on this anniversary. Sweetheart, you’re a special part of my heart and soul. You have created a rainbow inside my heart with your heavenly love. Keep loving me like this! With you, my life getting better every single day and I know without you it won’t. Today I promise that all my dreams are about making yours come true. Happy Anniversary! Peace, love, happiness, romance these all things permanently appeared to me when I have got married to you. You are such a divine gift for me. Happy Wedding Anniversary. You’re my colorful dream, an artist painting, You’re the light of my moon, Sunshine in the morning, You’re the only shore in my river and my love forever! Happy Wedding Anniversary!